Spirit Halloween continues to unveil sneak peeks at all kinds of new products coming exclusively to the season pop up stores this fall, and they just revealed a set of Pop! 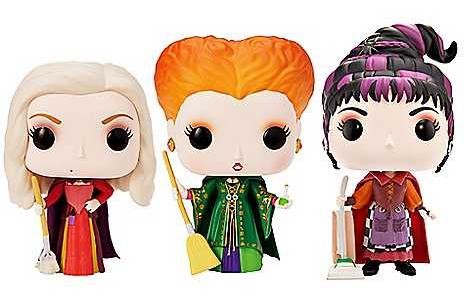 vinyl figures by Funko of the Sanderson sisters from Disney’s Hocus Pocus. Collectors and fans of the family-friendly Halloween favorite can now get all three witches, Winifred, Sarah, and Mary, as officially licensed Pop! figures, available individually or in a three-pack, exclusively at Spirit Halloween stores. The figures are expected to ship on or before September 30. This is the third sneak peek of an officially licensed product from Spirit Halloween, following reveals of the 6-foot Michael Myers animatronic prop and the 2-foot free-roaming Chucky animatronic prop. You can order the Hocus Pocus three-pack here.